After enjoying Gnatterbox for nearly a year now, I though it about time I actually made something in Gn15. 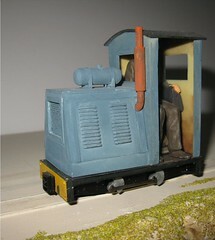 I had a Bachmann Gas Mechanical spare and decided to build a small diesel using mainly the scrap box for parts. 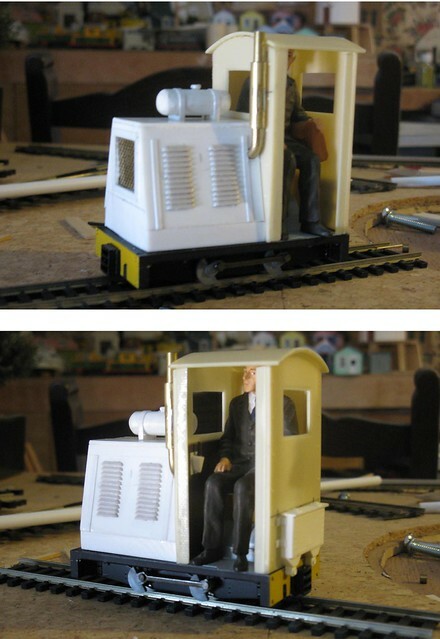 I purchased the Sidelines cab, to get a feel for the loading gauge and added a bonnet from plasticard. My inspiration was a Schöma diesel drawing that was published in Narrow Lines many years ago. I added Cambrian Models louvres, a Boulder Valley sand box, and an exhaust made of concentric MS brass tubing. The fuel tank followed details given by Zoange in the Gnatterbox. 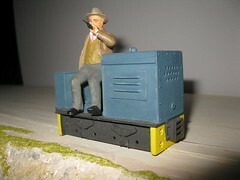 The figure is a Preiser passenger who just about fits, although he does have a very worried expression. Perhaps he finds the cab a little claustrophobic. So all I have to do now, is decide on a colour and pluck up courage to wield a paint brush. I did paint the Schöma as the picture shows. I started with a mucky cream for inside the cab and added muck and rust in thin washes at floor level, which I was pleased with. I brush painted the body in Humbrol blue which again came out reasonably well and adds a little Continental flavour. After that it was just picking out the details and there you have it. I was pleased enough to copy the "livery" onto the Dragonfly I am currently building. I like the interior colour, suitably grubby near floor level.